According to Gartner research, 90% of IT leaders will not purchase new premises-based UC infrastructure by 2021 — up from 50% today — because future cloud UC offerings will be far ahead in terms of features, functions, portals, analytics and dashboards. 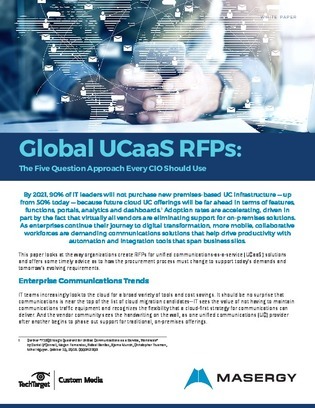 This custom white paper explores how organizations create RFPs for unified communications as a service (UCaaS) systems and offers some timely advice as to how the procurement process should change to support today’s evolving demands. Discover a 5 question RFP approach that every CIO should consider when futureproofing their UC technologies.